Facebook has ended its attempt to bring internet connectivity to the entire world through autonomous drones. The social media giant has announced it will be halting Project Aquila, which looked to get the four billion people without internet access online. "When we started the Aquila program back in 2014, very few companies were involved in this area," Facebook's Yael Maguire wrote in a blog post announcing the news. "It's been exciting to see leading companies in the aerospace industry start investing in this technology too — including the design and construction of new high-altitude aircraft." "Given these developments, we've decided not to design or build our own aircraft any longer." The news will also mean the closing of a plant in Bridgwater, Somerset, although Facebook says it will continue working with partners like Airbus on related technology. First announced in 2014, Project Aquila's drones had the same wingspan of a Boeing 737, but only weighed as much as a family car. 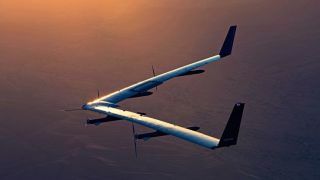 Facebook's tests saw the drones achieve 96 minutes of flight time over the Arizona desert, but it didn't advance much further than that, despite the company aiming to have it fly for 90 days. The craft was hoped to beam down internet connectivity across 60-mile packets of land, providing an online gateway to users that previously had no access. Want to know more about 5G? Check out our guide here!